Chairing the U.S. Securities and Exchange Commission is a great privilege and I am fortunate to be able to observe firsthand the incredible work done by the agency’s 4,600 dedicated staff. In the pages that follow, you will find a record of their work in pursuit of the SEC’s three-part mission of protecting investors, maintaining fair, orderly, and efficient markets, and facilitating capital formation. The SEC recently released our Strategic Plan for 2018–2022, which outlines three goals that will guide the work of the Commission moving forward. I believe that in the body of this report, you will see we have made meaningful progress over the past year toward satisfying these goals. 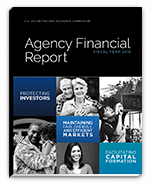 We introduced our Regulation Best Interest proposals, which are designed to serve Main Street investors by updating and enhancing the standards governing broker-dealers and investment advisers to bring them in line with what Main Street investors would expect. Our Retail Strategy Task Force, launched last year, continued its work in developing proactive, targeted initiatives to identify misconduct impacting retail investors. The Office of Investor Education and Advocacy launched a multimedia campaign warning investors of common hallmarks of fraud. Our efforts in the municipal bond market, a largely retail market, are bringing greater transparency to trading and better equip investors to make informed decisions about municipal securities.